In resolving the hot core of one of the Earth's closest and most massive star-forming regions, the Chandra X-ray Observatory showed that almost all the young stars' temperatures are more extreme than expected. X-ray contours of the Chandra observation overlaid onto the optical Hubble image (courtesy of J. Bally, CASA Colorado). 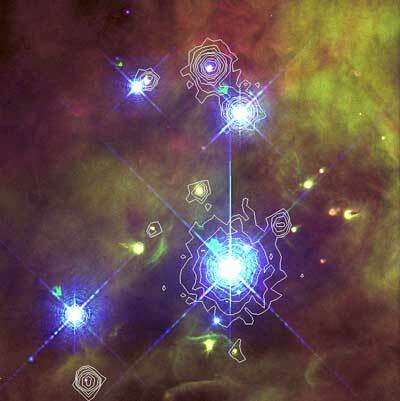 Besides the bright main Trapezium stars, which were found to be extremely hot massive stars, several externally illuminated objects are also X-ray emitters. Some of them with temperatures up to 100 Million degrees. The ones that do not show X-ray contours are probably too faint to be detected in these particular Chandra observations. The latest in NASA's series of Great Observatories. Chandra is the "X-ray Hubble," launched in July 1999 into a deep-space orbit around the Earth. Chandra carries a large X-ray telescope to focus X-rays from objects in the sky. An X-ray telescope cannot work on the ground because the X-rays are absorbed by the Earth's atmosphere.